Last week, the White House released a brief that, among other things, suggested I was wrong in claiming the president has taken credit for far more economic success than he deserves. It does not take long to compile evidence to support my mild claim. First, President Trump misrepresents the actual conditions and trends of the economy he inherited from President Barack Obama. He has made a number of claims, for instance, that growth was in decline when he took office. “Had I not won, we would have been in negative — we wouldn’t be at 4.2 percent. We would have been in negative numbers. We were going down. We were low, and we were headed down,” Trump said at a rally earlier this month. However, a 4.2 percent Q2 growth rate is hardly an economic turnaround of historical proportions as Trump claims. 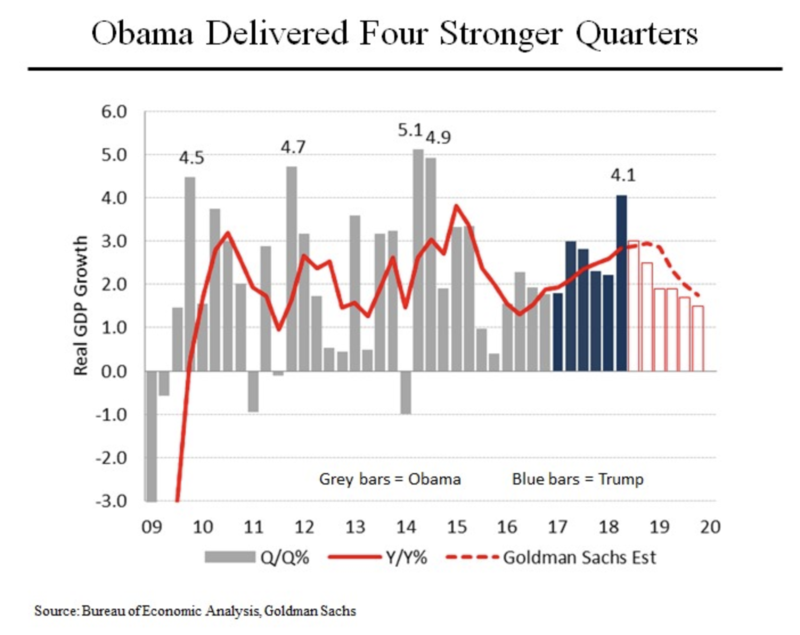 The Obama administration had four quarters of higher growth than 4.2 percent and many others that were nearly as high. Annual growth rates since Trump was sworn into office also remain in the same range as they have been since 2010. To go even further, he touts that the gross domestic product rate is higher than the unemployment rate for the first time in 100 years. This is simply wrong. Since the government began collecting the official data series tracking GDP and the unemployment rate in 1948, the annual rate of real GDP growth, measured on a quarterly basis, has exceeded the jobless rate more than 60 times. “The GDP Rate (4.2%) is higher than the Unemployment Rate (3.9%) for the first time in over 100 years!” Trump wrote on Twitter. Second, on jobs, Trump attempts to take credit for trends in job creation that were well-established before he took office. It is true that the United States has experienced its longest streak of consecutive positive monthly job growth. But almost 80 percent of that — 75 months of the 95 in the streak — occurred under Obama. There was also not a marked improvement in the size of the monthly job growth figures or in monthly unemployment after Trump took office, despite his exaggerated claims on the contrary. “We are breaking all Jobs and Economic Records but, importantly, our Country has TREMENDOUS FUTURE POTENTIAL. We have just begun!” he wrote on Twitter earlier this month. Third, Trump claims that wages are up for the first time in a long time. Again, it doesn’t take much digging into publicly accessible government data to find that trends in wage growth have been rising steadily since 2014. “Wages, for the first time in 18 years, are rising again,” Trump said in July. Finally, the most common exaggeration Trump has made — at a rate of once publicly per every two days — is that “we have the best economy in the history of our nation.” By just about any important measure, the economy today is not history making and, again, is a case in which Trump is not only taking credit for economic performance he doesn’t deserve, but also claiming economic performance we don’t have.